What are You Getting Out of Congregational Worship? What are You Putting In? A little housekeeping before today’s post. I was on vacation last week and didn’t get to put up the weekly post from one of our shepherds. To help us stay on schedule and to avoid putting up two posts today, I’m just going to provide you with Ron Adams article on getting the right things out of our congregational worship experiences and get back to writing my weekly articles next week. Thanks, Ron, for your work on this post. There is a great movement in the religious community to make public worship periods more meaningful and less boring. In an effort to make a broader appeal to potential worshippers and draw more members, some have resorted to all types of innovations to appeal to the masses. When a congregation of God’s people examines means and methods to make our worship together more meaningful, the examination should start within the individuals who participate in those services. If a congregation practices only those things authorized in the scriptures, and we still don’t have the experience we think we should take away from our worship, I suggest we start looking inward for answers. We think the worship is boring. Have we become so overly entertained by the world that our worship seems lacking in comparison? We come away saying to ourselves that we got nothing out of the service. Please let me know what scripture teaches that the thrust of our worship is to please us and meet our needs. Oh, that should certainly be a byproduct. Have we become weary of worshipping God like the children of Israel as mentioned in Isaiah 43:21-24? When we do, we will bring tainted sacrifices like they did. Are we making God weary of our sacrifices? Have we become so bored, we are going through the motions of worship? Worship was never intended to be boring. The very word, worship, should evoke powerful emotions within us. We should come before Him with thanksgiving, praise, humility, love, and reverence. We should be excited when we offer Him our grateful praise. All this can be lost in a mindless, unprepared period of routine with its shallow, self-centered worship. If this is our attitude, our worship together will certainly be boring. Some try to create an artificial sense of excitement and energy by having a fast paced song service and high energy, feel good sermons. Some services dull our sense of real worship by tranquilizing us with quiet, muted colors, organ music, and a sermon delivered in a smooth, calming “preacher voice.” We try to replace a deep reverence for God, our creator, and the deep feelings elicited by the lessons we learn with hand clapping and arm waving. 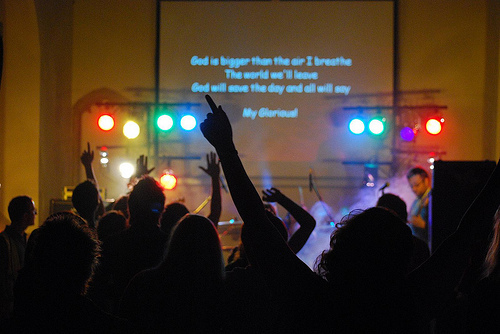 How do we lose the real sense of excitement when we worship God? There may be a sense of boredom developed by entering into our worship unprepared. We spend our time preparing for our busy Saturday evenings, preparing for our recreation filled Sunday afternoons, and let things like preparing our minds and our Bible study lessons go undone. We let our minds wander during the worship because we have not put in the preparation and effort to actively participate in worship. Our lives are so busy we just don’t have the time to give to proper worship preparation and are, therefore, bored. We believe in preparation in all our worldly endeavors, yet, we make little or no preparation for our worship together. We try to cut corners and create artificial stimuli to draw out the emotions we desire. That is not the answer. The answer is the humble heart of one with great needs and who is prepared for worship. This soul is one who has a great appreciation for God, Jesus, the Holy Spirit, and for all their gifts. A soul who follows God’s worship values will have meaningful and exciting worship experiences. ”Who will not fear, O Lord, and glorify your name? For you alone are holy. All nations will come and worship you, for your righteous acts have been revealed” (Revelation 15:4). Only God is worthy of our worship; because of all His righteous acts. His willingness to provide salvation from our sins through Jesus’ sacrifice should excite us to the point we enthusiastically engage in worship to Him. Are you bored with our public worship? Do what is recorded in Lamentations 3:40, “Let us examine and probe our ways, and let us return to the LORD” (NASB). Ask yourself; is worship about me or about God?